In this third installment in the #1 bestselling Stalking Jack the Ripper series, a luxurious ocean liner becomes a floating prison of scandal, madness, and horror when passengers are murdered one by one…with nowhere to run from the killer. 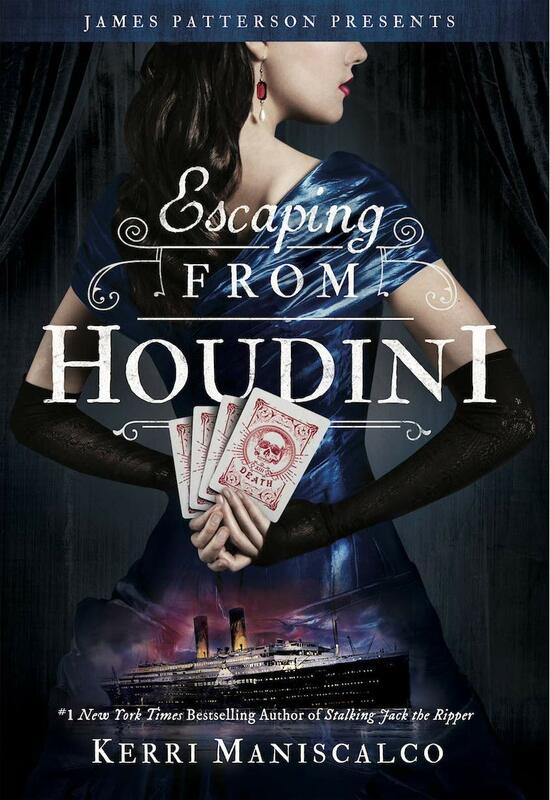 The Stalking Jack the Ripper series is one of my favorites, so I’m over the moon that I am a part of the the Escaping From Houdini blog tour! Since this is a review of the third book in the series, there might be spoilers to the previous two novels below. I will however avoid major spoilers of Escaping From Houdini! Audrey Rose is excited about taking off on a new adventure to America with her uncle and her partner and near-betrothed, Thomas Cresswell. As they settle onto the RMS Etruria, they are delighted to find out that the Moonlight Carnival will be performing magic each night for the first class. However, their amusement quickly turns to horror after an audience member is murdered during the first performance. Now Audrey Rose and Thomas are after another serial killer, one who cannot escape since they are all trapped on a ship. It’s a race against time as they try to solve the case before a new victim is claimed. One of my favorite parts of the SJTR series is the fantastic settings, and Kerri Maniscalco holds nothing back in Escaping From Houdini. While we are on a ship for the entire novel, the Moonlight Carnival brings it’s own setting with fascinating magic tricks and interesting characters. The descriptions of all of the costumes, staging, and performances are breathtaking and I so wish I could watch them in real life (minus the murders of course)! Another favorite part is the banter between Audrey Rose and the charming Thomas Cresswell. Before Audrey Rose is consumed by the latest serial killer case, she and Thomas seem to be in a great place in their relationship. However, as the case unfolds, Audrey Rose makes a bargain with the mysterious ringmaster, Mephistopheles, which brings her closer to the Moonlight Carnival performers and where she hopes to find the murderer. Part of the deal involves lying to Thomas, though, which strains their interactions and Audrey Rose ends up spending a lot more time with Mephistopheles and the performers. The ending of the review copy I read differs to the one in the finished copy so I am interested in finding out what was changed. I don’t want to talk about the mystery too much as I would hate to spoil it, but the mystery itself is fascinating. The murders were all gruesome in their own ways and fashioned after the different tarot cards. I, just as much as Audrey Rose, was waiting at the edge of my seat for the next surprising murder to occur. Overall, fans of the previous books will love the enchanting setting and twisty mystery in the latest installment of the Stalking Jack the Ripper series! As part of the tour, I am also featuring an aesthetic I created of the book! Hopefully this will put you in the mood for some magic, mischief, and mayhem! Good luck! I hope you get a chance to read the book soon!